It’s no secret that we love books and reading. 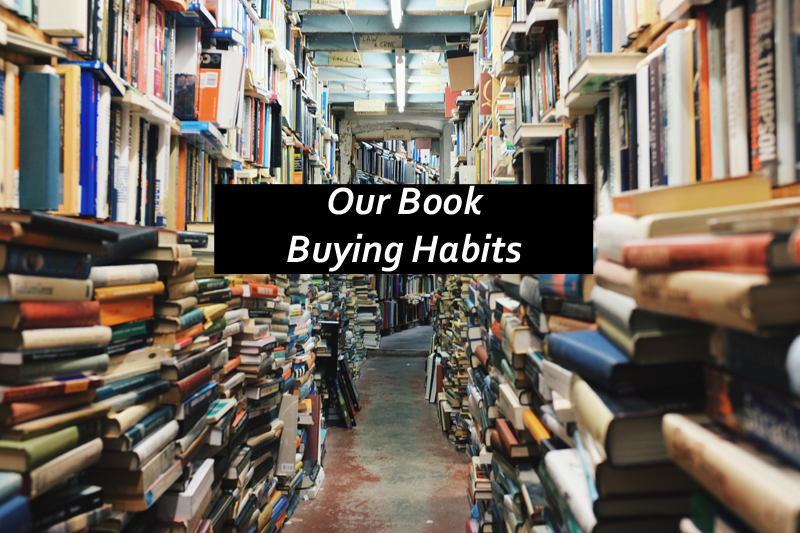 Although both of us are heavy library users, we do still buy some books and we thought we would share our Book Buying Habits … like @ Book Talk: My Book Buying Habits. Tanya: Mainly Barnes & Noble and Amazon. I tend to buy specific books, and am not the browse and buy type. Kim: I used to mainly buy from Barnes & Noble and Amazon back when I bought physical books. The only books I buy now are from my Audible membership. Tanya: I’ve never pre-ordered a book. Kim: I have pre-ordered Audible books a couple of times. Tanya: Maybe 1 every 3 months. Kim: My Audible membership gives me two credits (2 books) per month. I don’t always use those right away though. Sometimes I save them up. I currently have 6 credits to use and can’t decide on what to get. Kim: YES! I get the books I want to read in paperback/hardback from the library. My library doesn’t have a great selection of audiobooks. Kim: I honestly don’t think there is a limit. I typically come home with 1-3 for myself and up to 20 picture books. Tanya: I wholeheartedly support libraries. They allow me to try out authors I might never have otherwise read if I had to straight up buy their books. I also regularly recommend / request library add books (i.e. improve their selection of #ownvoices authors. Kim: I’m a die-hard library fan and a librarian so I love them. I typically read a book from the library and then decide if I love it enough to purchase it for myself. Tanya: Anyone / place that supports books is a A-OK in my book. I understand that authors don’t directly get $ from the sales of these books, but libraries, they offer an opportunity to increase your reader / fan base. Kim: I don’t really buy physical books much anymore but when I did, I loved the local second hand book shops. Tanya: I try to read all the books in my bookshelves – having unread books sitting around would cause me anxiety. Kim: Sort of. I have a stack of books that I need to donate to the library that I decided I no longer have interest in reading. I do plan to read every books that I’ve decided to keep though. Tanya: Donate them to the library – someone else might like it. Kim: Donate them to the library. Here’s the thing though, you have to be okay with them selling those books in their annual book sale if they decide they don’t need to add them to their collection. Kim: Yes. Spread the book love. Tanya: Nope. Never needed to. Kim: Not really but I did conscientiously decide to stop buying physical books regularly a couple of years ago. I will buy a book if I love, loved it. Tanya: Nope … but occasionally I borrow too many books from the library and have to return some unread. Kim: Not anymore but a few years ago, yes. So what are your book buying habits like? Do you buy or borrow more of your books?